Sunroof, Adaptive Cruise Control, Bluetooth, Rear View Camera, Heated Seats! This Subaru Forester is well-prepared to keep up with your life, from planned vacations to spontaneous hiking trips. The wide cargo area can accommodate four large suitcases and even the bulkiest of adventure gear. This Subaru Forester boasts an unbeatable combination of all-road and all-weather capability, superior reliability, advanced safety features, exceptional value and sheer driving enjoyment. This white SUV has an automatic transmission and is powered by a 2.0L H4 16V GDI DOHC Turbo engine. Motivated by that frugal motor it gets 10.2 L/100 km in the city and uses just 8.6 L/100 km out on the highway according to Transport Canada. Our Forester's trim level is 2.0XT Touring w/ Eyesight. The Touring trim adds some desirable features to this versatile Subaru. It comes with Bluetooth, 6-speaker audio, heated front seats, a rearview camera, a power tailgate, a power sunroof, dual-zone automatic climate control, EyeSight driver assist technology which includes adaptive cruise control, pre-collision braking, lane keeping assist, and more. This vehicle has been upgraded with the following features: Sunroof, Adaptive Cruise Control, Bluetooth, Rear View Camera, Heated Seats, Power Tailgate. To view and download a brochure open this url https://www.joomag.com/Frontend/WebService/downloadPDF.php?UID=0500302001497554325. 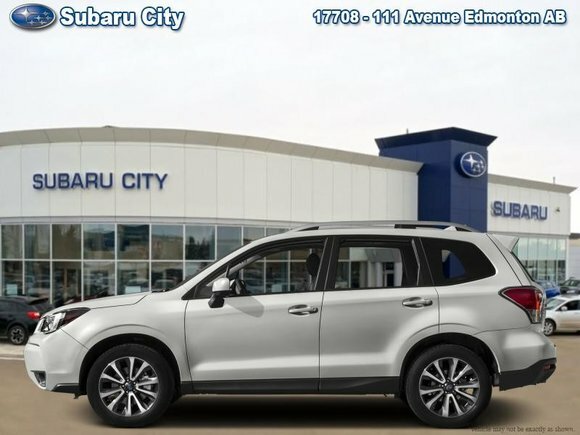 Want to try the 2018 Subaru Forester 2.0XT Touring w/ Eyesight?